A Luxurious, Executive, custom built home of this caliber, with these innumerable features and a walk-out basement, rarely becomes available. The location of this home is optimum, giving you the best of both worlds. It is close enough for you to be downtown in under and far enough from downtown to offer an almost .5 acre property, fully landscaped with fruit trees backing onto a creek with walking trails that go on for miles. It is just like having your own personal resort. This entry was posted in News and tagged Ethos_Realty, Five bedroom, Four Full Bathrooms, hardwood flooring, realtor rosalie, rosalie drysdale, Single Family Detached, Walk out basement, winnipeg realtor on April 24, 2018 by Rosalie. Showings start Thursday, May 18. Open house Sunday, May 21, 2 – 4 pm. Excellent home for growing family in a wonderful neighborhood. Close to schools, shopping, transportation and U of M. Lovely/gently lived in bungalow with vaulted ceilings. Open concept. on this Home at 57 Branson Crescent by clicking on the address. This entry was posted in News on May 16, 2017 by Rosalie. Great open space layout. Good size LR with large front window. Newer kitchen cabinets, flooring and appliances (2015). White quartz counter tops and white subway style back-splash. Very trendy/clean look. Also newer ceramic floor tiles and wide planked dark laminate hardwood floors. on this Home at 772 Autumnwood Drive by clicking on the address. Brand new spacious open concept bungalow. 9 foot ceilings, 12 ft ceiling in front foyer. Extra wide hallways. Large windows, allowing tons of natural light into the home. Att 3 car garage. Garden doors from dining area lead to covered 320 sq ft deck and separate door from master berm to covered deck. Gas fireplace in living room, all five stainless appliances incl (Kitchenaid). Central A/C. Cabinets will be white maple shaker and Expresso wood island. Countertops are white Quartz. White subway tile backsplash. Large walk in pantry off kitchen. We have pictures of this home. Follow the link for more information on this Home at 361 Drury Ave by clicking on the address. This entry was posted in News on March 12, 2017 by Rosalie. Elegant home situated, neighboring historic Peanut Park in Cresentwood /River Heights. Stately and solid with beautiful woodwork. Unique open spaces with an abundance of natural light in this elegant home. Ideally situated, neighboring historic Peanut Park in Cresentwood /River Heights. Grand, designer-influenced entrance with multiple, leaded glass French doors. Spacious living and dining rooms with gorgeous quarter-cut dark oak hardwoods. Living room leads into a comfortable 4-season sunroom. Large eat-in kitchen beside bar with granite counter. Follow the link for more information on this Home at 70 Kingsway Ave by clicking on the address. This entry was posted in News and tagged 70 kingsway, Air conditioning wall unit, Bar dry, four season sun room, full basement, Gas fireplace, High-Efficiency Furnace, No Pet Home, No Smoking Home, Patio, Porch, real estate agent, realtor rosalie, rosalie drysdale, six bedrooms, Smoke Detectors, three full bathroom, winnipeg realtor, wood fireplace on February 9, 2017 by Rosalie. Pride of ownership here!! Meticulously and lovingly maintained. Peaceful and quiet location. (Vendor states – excellent neighbors) Treed lot with lots of serene privacy. Great family hm with L.R, Family room AND a rec room. Peaceful walking path right beside home. Lots of storage. Average Heat/hydro bills are approx. $180/month. Beautiful front porch. backyard is breathtaking. Very private. Excellent family home. Close to all amenities – pretty much every kind of shopping, transportation, parks, schools. Don’t miss this lovely home! We have More then 40 plus pictures of this home. Follow the link for more information on this Home at 104 Winslow Drive by clicking on the address. This entry was posted in News and tagged #realtorscanhelp, #winnipegrealtor, 104 winslow drive, Air Conditioning-Central, contact page for realtor rosalie, family room, four bedroom, four bedroom home, rosalie drysdale, three bathrooms on June 3, 2016 by Rosalie. Completely reno’d with Highest Quality and beyond basic building codes. New 200 amp service.Shingles 2011 (30 yr fiberglass), eaves and fascia 2013, ALL new triple pain windows 2012, new insulated garage door, new fence and deck. New Birch HARDWOOD flooring 2nd level and Family Rm (main). Entire Kitchen and all bathrooms new (2013). New Garburator, new water line in fridge,Brand new gas stove top(modular,griddle/grill/burners) (spice rack on either side), kitchen. floor duo-ceramic, custom cabinets, all granite counter tops (kitchen and baths). We have More then 90 plus pictures of this home. Follow the link for more information on this Home at 38 Stonehaven Close by clicking on the address. This entry was posted in News on May 12, 2016 by Rosalie. When your mortgage application is being considered, your lender will look at your credit habits: do you pay your bills on time? Do you tend to get over-extended on your credit card? These habits are reflected in your credit rating. In order for your lender to assess your borrowing profile, you’ll need two revolving sources of credit that are each at least two years old. Pay every bill on time. That one habit is your single biggest game-changer. Don’t run up your credit cards. Use the 50% rule. If your limit is $5000, never let the card go higher than $2500. Don’t ever let any bill go to collections, even if it’s for a small or disputed amount. These black marks on your credit are hard to erase. If it’s happened, be prepared to explain why, and be sure it’s paid in full and reported to Equifax. If you’ve ever been bankrupt or under a consumer proposal, you’re going to have some extra challenges. You’ll need to have been discharged for two full years. And you’ll need to prove that you’ve re-established credit after the discharge, with at least two re-established revolving credit items and two-year history of satisfactory repayment. Strong income and downpayment will help. If you’re wondering how to polish up your credit, get in touch. I can review your situation and give you some tips on how to boost your credit rating. What are you doing next week? It might be a perfect time to get started. Completion Mortgage. Just like it sounds, this is for situations when you don’t need to actually come up with full funding until the home is complete and move-in ready. You’ll need to provide a down payment when you make an offer to purchase the planned home, and then the mortgage you are approved for is advanced to the builder at possession. Progress Draw Mortgage. This mortgage will give you funds at specific intervals as the house is built. Generally, you’ll need to provide a progress report and have an inspection in order to secure the next “draw” of funds. While the number of draws can vary, it is common to have three draws: one at rough-in, one at completion, and a final draw when you take possession of the home. 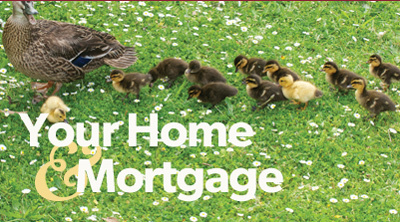 Once the home is completed, the mortgage will be converted to a conventional home mortgage. Be prepared! Get me involved as early as possible in the process. I’ll outline everything you need to consider and all of the documentation you’ll need, so you can dream on! This entry was posted in News and tagged http://www.peterpaley.com/, invis mortgage broker Peter Paley, mortgage by invis mortgage, peter paley, Two mortgages to build your dream home on May 12, 2016 by Rosalie. Private, Peaceful, WATERFRONT – your own corner of Paradise at the end of the road on large quiet bay with 400 feet of water frontage. Almost 5 acres of the tranquil outdoors. Beautiful walking path along the lake, with a dock and a different sunset every night. Cozy year round 1150 sq ft log cabin. Large newer kitchen with newer stainless steel appliances (incl double oven. Large, living room and dining room which is beside a large picture window with view of the lake. 2 bedrooms plus a den and a four pc bathroom. 3 ceiling fans. Gorgeous feature stone wood burning fireplace C/W with fan.Laundry room with small office space. All newer window. Huge wrap around deck built on piles. 200 amp oversized garage with workshop and 16 ft overhead door. All contents from cottage incl. (All contents of garage not incl). Boat house located down the path with 2 overhead doors. 2 Octagon Cedar screened in Gazeboes- one beside cottage and the other elevated with view of lake. Snowmobile trails in winter. So much more! This entry was posted in News and tagged 4.73 acres, boat house, cottage, dock, gorgeous wood burning fireplace, over 1100 sqaure feet, oversized dbl garage, three bedroom, upgraded kitchen, year around home on April 18, 2016 by Rosalie.